The most glaring thing on here is how badly UCLA was abused during that five game losing streak in December and January. Miller notes that judgements occur in November and unfortunately UCLA’s 2015 regular season is remembered as much for what happened in Chicago as anything else. But not everyone should be judged for what Kentucky did to them. After all, Texas A&M took those Wildcat to double overtime before losing. They’ve now just bowed out of the NIT. Alas, look at how the Bruins have progressively improved on offense. It’s distinctly more than they’ve improved defensively which I’ve always felt was going to be limited based on depth and scheme. The Pac-12 is jam packed with guards, generally good zone busters. For example, UCLA had the highest 3FG% against them in conference. They also allow tons of threes. This is a bad-to-terrible combination of style and luck. 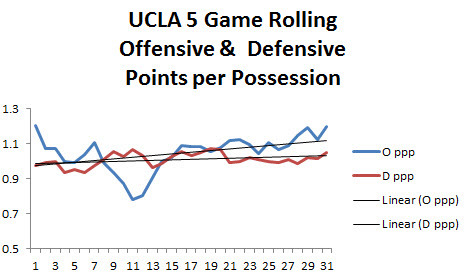 But claims of UCLA’s improvement are valid and they’re currently playing some of their best ball of the year – fortuitously or by design – in March. The 0.92 ppp SMU achieved was the Bruins’ best defensive performance since early January. They followed that with their second best offensive output (1.37 ppp) of the season. Which I suppose serves as I microcosm for UCLA’s entire season: They just can’t put it all directly together. Of course their offensive success as come as they’ve played better and better together. As I noted in February, when the Bruins share the ball, they play better! These aren’t your dad’s Zags. This isn’t a soft group of mop haired kids who beat up on the Jesuits. This is a beautifully crafted roster of veterans that is versatile to beat you in an assortment of ways. Mark Few’s bullies are second in the nation in 2FG% (57.4%), twelfth in FG% at the rim (66.9%). They effectively get the ball to Przemek Karnowski or Damantas Sabonis and get interior buckets. Of course Byron Wesley – a big and powerful guard, the kind Gonzaga hasn’t traditionally had – will gladly get to the rim. He slashes to the tin, getting 40% of his offense there connecting on 71% of those attempts. The Zags have size and they effectively use it. And they can rain threes, too. Mark Few’s best team ranks 3rd in 3FG% at 41%. They’re going to get seemingly whatever they want wherever they want it. You can criticize their schedule but their non-conference SOS was third best amongst remaining teams and I already proved that doesn’t really mean anything. By adjusted efficiency, this is the best offensive Mark Few team ever. Gonzaga has ranked outside of the adjusted offensive ratings just once since 2012. These guys can score it. Which is not me hypocritically criticizing the WCC – simmer down. Arizona only got to the rim five times against the Zags. They’re indubitably bigger than the other kids. Yet that projects. And now they’re playing against the same size kids. And beating up the Iowa Hawkeyes’ 36th ranked 2FG% defense. The Zags shot 61% inside the arc (and a devastating 63% from beyond). 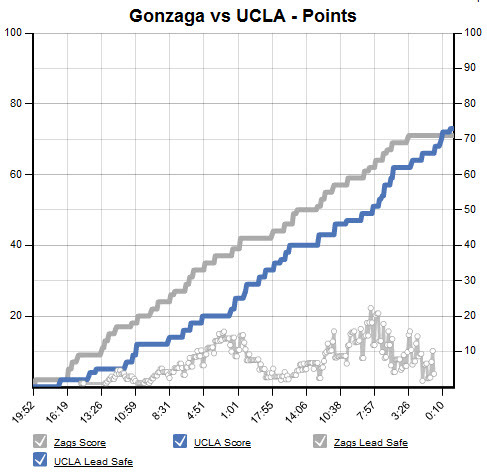 In the first iteration of this game – as we’d previously noted – Gonzaga incited a five-game losing streak for the Bruins in which they averaged 0.78 points per possession on offense. It’s offensive. Now on an individual basis, I think we can agree there are some opportunities here for the Bruins. Kevon Looney & Kyle Wiltjer could wind up must-see-TV. Norman Powell and Byron Wesley is almost a toss up. But the point here is that the Bruins’ best chances are with their best five. How long can that group last? In December, Looney fouled out and Powell and Parker had four fouls each. Yet when we began this conversation – and here’s the payoff for that sweet chart at the beginning of all this – we noted UCLA’s improvement. For example, Thomas Welsh played 19 minutes in both games against Arizona this year. In the first contest he scored zero points and committed five fouls. He did not play well. One month later, however, he scored 7 points, grabbed 4 boards, handed out 2 assists (season high!!) and committed only two fouls. The Bruins who lost by 13 at home to Gonzaga aren’t these Bruins. You’re likely to hear a lot about UCLA’s starting five being the only starting five to all score in double figures. They’re also the only starting five to average 42 minutes per game. For them to have a shot in this game, however, it’s going to take a team effort beyond those five. They’ll need a spell. And they’ll need to share the ball as they’ve done when they’ve been successful. Fortunately for the Bruins, forcing lots of threes can sometimes be an effective defense. It’s been well documented that 3FG% against is often a matter of luck. A cold night for the Zags could spell trouble similar to how North Dakota State kept things close as the Zags shot 7-22 from deep compared to their own 10-21 3FG. There’s reason for optimism here, Bruins. Last I saw Gonzaga in a rematch of a classic NCAA tournament game was in last year’s second round. The Bulldogs drew my Wildcats and we were riddled with images of Blake Stepp missing a shot he’d probably made a billion times. That would’ve proven the game winning shot in an epic double-overtime thriller. 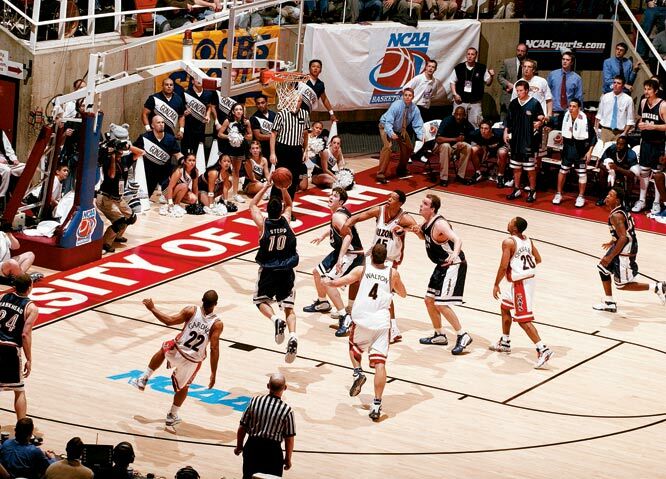 And so now we find ourselves in another Gonzaga-Pac rematch of a classic game that also includes iconic imagery. I’m very much upset that there isn’t a KenPom win probability graph for that 2006 game. The best I’ve got is this score chart which is probably equally devastating to Bulldog eyes: In the Arizona-Gonzaga rematch, the Wildcats won by 23. How will the Bruins fair? 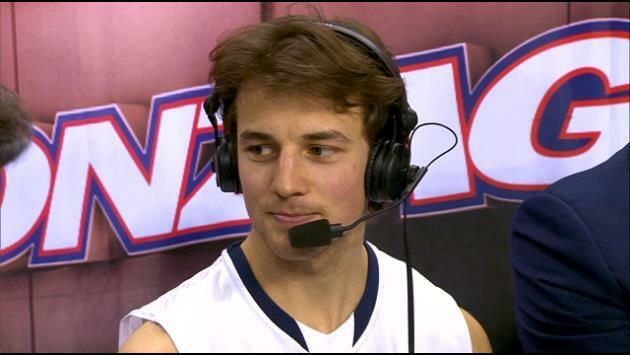 Gonzaga got whatever they wanted against UCLA in December. No rim challenges, no aggressive hedging, no hard fouls, no fight from the Bruins. UCLA was a fragile team. Alford’s biggest asset as coach is his ability to connect with his team. That was Howland’s greatest weakness. This team lost five players to the NBA (I swear both Wear twins are currently in the NBA). It lacked depth and cohesion. Mainly it lacked confidence. It didn’t have an identity. The offense had terrible spacing and it’s execution in the half court was non-existent. UCLA was utterly embarrassed by Kentucky in a national game that resonated all the way to Selection Sunday. But, somehow, this team persevered, stayed connected, believed in one another and got better. The much maligned bench gelled once their roles were defined. UCLA still suffers through inexplicable bouts of poor play – usually once a half for 4-5 minutes – which usually gives back the, mostly, good work it achieves the other thirty minutes. All that said this team is playing it’s best ball right now and that’s important. Important because they will need to play their best game of the season to defeat Gonzaga on Friday evening. And wouldn’t that be a joy to see. Totally agree on Parker and Hamilton but particularly Parker. His performance is critical if not linchpin to any chance for UCLA. The Zags are huge and Tony is almost all by himself. That said, a heroic effort from Mr. Welsh and/or GG could go a long way. Whatever the case, Parker has got to be great – not just good. I’m excited to see Norman on the biggest stage and I love your bold prediction. Best of luck and – if I hadn’t said it before – great reading your comments as always. Cats move on easily tonight…hope you get to exorcise those Wisconsin demons on Saturday.